On a cool winter’s afternoon in Temagami, about 70 kilometres northeast of Sudbury, a 51-car train operated by Ontario Northland jumped its track while rounding a right-hand curve. The first 13 cars were spared, but when all commotion came to a halt the conductor discovered that 29 cars near the back had been lost, some tumbling down an embankment – most carrying highly corrosive sulphuric acid. By the time the dust settled, authorities determined that 386,000 litres of the nasty liquid had leaked out from damaged cars, more than the average Canadian household consumes in water over an entire year. Much of it found its way into a nearby creek and lake, killing fish and bottom-feeding organisms like snails, clams and insects. Regulators determined that “weakened track structure” and poor track inspection were largely to blame for the March 2000 accident. The outcome could have been dramatically worse. That was made sadly clear by the 2013 rail disaster in Lac-Mégantic, where 47 people in the small Quebec town lost their lives after a train carrying crude oil derailed and exploded. 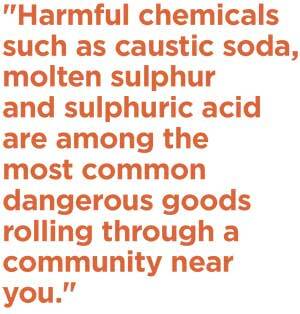 Fact is, a material needn’t go boom to make it dangerous or pose a serious harm to the local environment. Every day, across tens of thousands of kilometres of track, trains are transporting a long list of toxic and corrosive chemicals, often over vast distances and through densely populated areas; sometimes when less hazardous and just-as-economical options exist, such as on-site chemical recycling. 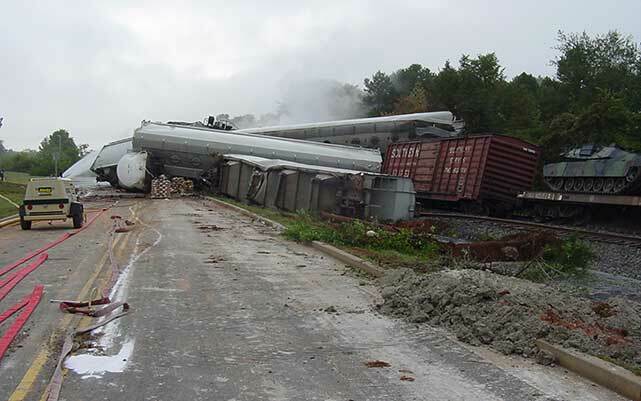 In Sept. 2002, 27 railcars jumped their tracks in Farragut, TN, spilling sulphuric acid. Public concern – and media attention – may focus on the risks of transporting petroleum products by rail, but harmful chemicals such as caustic soda, molten sulphur and sulphuric acid are among the most common dangerous goods rolling through a community near you. Sulphuric acid, which can melt skin and lead to deadly gas clouds, has alone been involved in an alarming number of train derailments over the past 15 years. They include a May 2003 derailment that forced 50 residents near Orillia to evacuate because of leaking acid, and a January 2007 accident in which four railcars full of sulphuric acid hopped their tracks and crashed within a stone’s toss of a home in Montmagny, Quebec. Four months later, 150,000 litres of sulphuric acid leaked into a river after 22 railcars jumped their tracks about 215 kilometres north of North Bay. Acidity in the river reached dangerous levels, with local farmers fearing for their livestock. More recently, a railcar filled with sulphuric acid slid off its tracks in Richmond Hill, a heavily populated town just north of Toronto. There were no fatalities or injuries in these cases, as most have happened in relatively remote locations with low population densities. But for many the February 2015 derailment in Richmond Hill was too close for comfort. Regional councillor Tom Muench said luck might have been the only thing preventing a more serious accident. “It could easily have gone either way,” he told the local paper shortly after the incident. 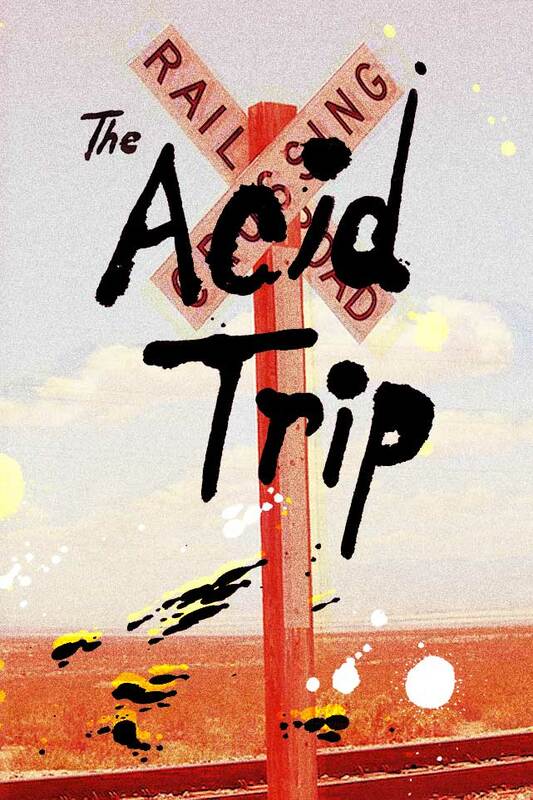 Sulphuric acid – sometimes referred to as Hollywood acid – may be better known as a body-dissolving chemical used by the Sicilian Mafia than a key ingredient for the operation of a healthy industrial economy. Last year, about 254 million tonnes of sulphuric acid were produced globally for a variety of purposes, making it the most ubiquitous chemical on the market. It is used to produce fertilizer, refine petroleum products, mine minerals, process metals, and manufacture synthetic materials such as rayon. It is also used to make higher-value chemicals in the form of detergents, dyes, pigments, drugs and explosives. Own a car? The battery under its hood is filled with sulphuric acid. “Sulphuric acid, people don’t realize, used to be an indicator of the industrial wealth of a nation,” says Merv Fingas, former chief of research at the emergencies science division at Environment Canada, where he specialized in the spill of dangerous goods. But, he warns, it’s not an easy chemical to deal with. It’s generally colourless, making it tricky to identify in an accident. It can react violently with water and other chemicals, and beyond the severe burns it can cause to skin the inhalation of its vapour can be fatal. “You have to take the necessary precautions,” Fingas says. As an essential ingredient in many industrial processes and products, sulphuric acid is transported in massive quantities – typically by rail, both across Canada and into and out of the United States. Canada exported roughly 14 times as much as it imported in 2014. Of course, transport of highly flammable petroleum products is a major cause for trepidation, but drop dangerous and difficult-to-handle chemicals like sulphuric acid into the mix, particularly in the wake of the high-profile Lac-Mégantic disaster, and citizens say they have good reason to be nervous about what passes near their parks, playgrounds, schools and homes. “One thing the public wants to know is what (safety) improvements have been made since Lac-Mégantic, and what’s still to come,” says Kingston MP Ted Hsu, who held a community event on March 4 hoping to get some answers for citizens. At the event, Kingston’s fire chief expressed concern that he doesn’t get a list of the dangerous materials on a train before it passes through the community. Individual railcars are labeled, but to see what’s in them requires getting close, which isn’t so easy when they’re on fire and the situation is still potentially explosive. “If there’s a fire you have to put it out first to see the labels on the cars,” Hsu says. In such a situation, problems crop up with spills that involve sulphuric acid, which violently boils and spits when it comes into contact with water. There are also big risks even if no fire is present. One of the first things emergency workers will do when there has been an oil spill is try to soak up the mess with sawdust or some other sorbent. Doing so in the presence of sulphuric acid, according to the International Labour Organization, can create “toxic gases which fume off,” putting first responders and those nearby unknowingly at risk. 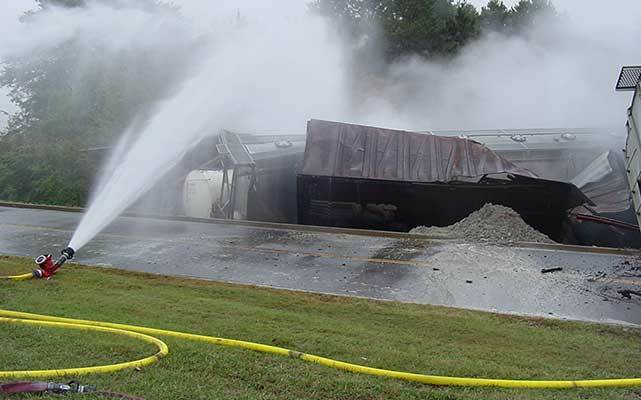 Sulphuric acid fumes from the Farragut derailment forced 2,600 residents to evacuate. The federal government and railway operators argue that real-time information detailing train cargo is both unnecessary and poses a potential security risk, if, for example, such information got into the hands of terrorists. “I don’t think we want that,” said CP Rail chief executive Hunter Harrison in March during a speech in Toronto. Currently, emergency personnel can call a Transport Canada hotline immediately after an accident to get a breakdown of a train’s cargo. Ottawa considers this a reasonable compromise. Speed and route choice are two other big sticking points for community leaders. In an unprecedented move, Toronto Mayor John Tory and 17 city councillors signed a letter in early April urging federal Transport Minister Lisa Raitt to consider lowering the speed of trains moving through urban areas. Transportation ministers from Ontario and Quebec made similar requests. In response, Raitt issued a temporary emergency directive requiring trains to slow down to below 64 kilometres per hour when travelling through “highly urbanized areas.” It’s cold comfort, considering the train that derailed and spilled a large volume of sulphuric acid near Temagami in March 2000 was moving at 63 km/h. CP Rail’s Harrison, meanwhile, has been critical of speed restrictions. He wants the ability to move his trains faster, arguing it can be done safely. Re-routing trains carrying dangerous goods through less populated areas is an idea that big city mayors like, but that does little to ease the concerns of those living in suburban and rural areas. One option is to reduce the volume of dangerous goods that need to be transported. For certain chemicals, such as sulphuric acid, on-site regeneration and reuse offers one way to reduce the risks. And it’s not just the risk of derailment. Chanier Mohamed, technical manager at industrial waste recycler Terrapure Environmental, says there’s a long chain of custody when transporting nasty chemicals like sulphuric acid. “You’ve got the risks in handling and loading, during transport, and unloading,” he says. The sulphuric acid regeneration market is growing, particularly in the petrochemical sector where it is used to produce high-octane gasoline and remove impurities from other refinery products, such as jet fuel. After it has been used, this “spent” acid waste is increasingly regenerated back into its pure state for reuse. The most popular method of doing this, however, is to ship the spent acid to a large, independent regeneration facility, such as the massive Dupont plant in Louisiana. It might eliminate the need to dispose of sulphuric acid, but it doesn’t eliminate the transportation of it. In fact, it can increase it. 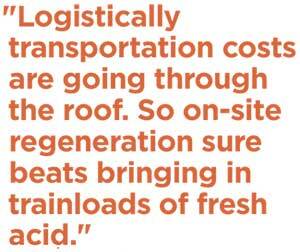 It’s why the business case for on-site regeneration is finding some appeal. Transportation costs and risks to the environment and public safety are part of the reason why Irving Oil built its own acid regeneration plant at its refinery in Saint John, New Brunswick. The plant, which began operation in 2000, was a first for a Canadian refinery, and meant the company no longer needed to import fresh acid and export spent acid by train. Matthew Viergutz, vice-president of licensing at MECS, the division of DuPont that handles sulphuric acid processing, says on-site regeneration tends to only be economical for large refineries, and mostly in developing countries with low construction and maintenance costs and poor transport infrastructure. “You really have to evaluate the economics of each situation,” he says. Indeed, market advisory firm TechNavio Research says the sheer size of the fixed investment required to build regeneration plants has discouraged small and medium-sized users of sulphuric acid from adopting the technology on site. However, “new production technologies are constantly being pursued in this space, and we predict the rise of small-volume regenerators over the next five to 10 years,” says TechNavio analyst Aditya Basu, who sees a “huge” business opportunity. At TerraPure, that has been Mohamed’s observation as well – only to him the trend became noticeable 10 years ago as more refineries, water treatment plants and mining operations began to see the benefits. Regenerated sulphuric acid only represents a small part of the global market for the chemical, and on-site regeneration is a small part of that, but there’s room for growth. Each 100,000 litres that is locally recycled represents a railcar that doesn’t have to roll through a community. It may not be economical yet for smaller users, but Kingston MP Hsu wonders if that’s because the risk of transporting dangerous goods isn’t fully reflected in the cost. “If they are paying the full cost of the risk, then they will make a smart economic decision,” he says.